What does it mean for Brent Kie winning the VISTA National 2018 Excellence Award? 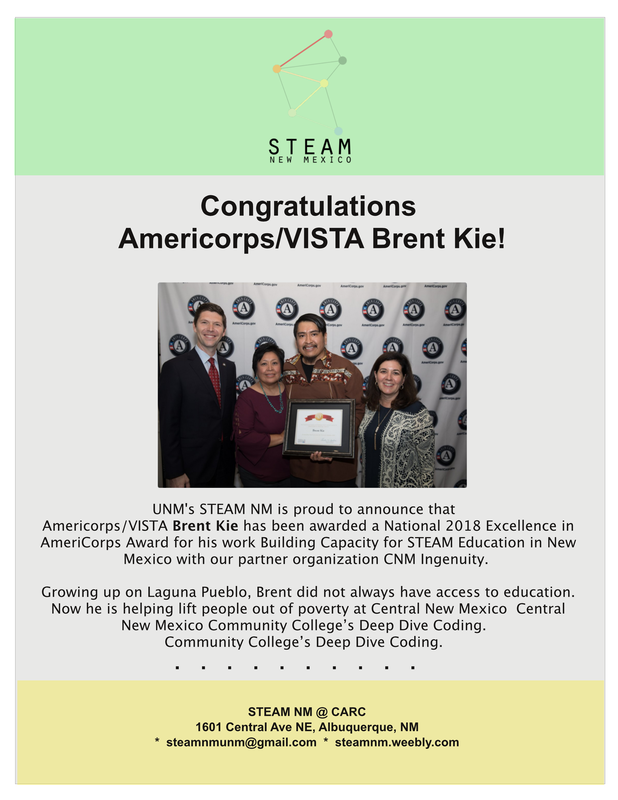 ​We are very proud to announce that on September 13 the Americorps/VISTA Brent Kie has been awarded a National 2018 Excellence in AmeriCorps Award for his work Building Capacity for STEAM Education in New Mexico with our partner organization CNM Ingenuity. Growing up on Laguna Pueblo, Brent did not always have access to education. Now he is helping lift people out of poverty at Central New Mexico Central New Mexico Community College’s Deep Dive Coding. ​Brent Kie started his third VISTA service in March 2018. He found out about the AmeriCorps VISTA program through a friend in college back in 2013. He chose to do service with STEAM NM because of the organization’s drive to incorporate art into traditional STEM fields to create STEAM. His service at his sub-site is about finding ways to recruit people in poverty to gain new skills so that they can find higher paying jobs to bring themselves into a higher income bracket. It is also about providing information to those interested in these programs so they can have an understanding of the tech workforce upon completing programs offered at Deep Dive Coding. Brent has been a VISTA member at CNM Ingenuity with such unparalleled commitment, enthusiasm and dedication that prompted his supervisor, Andrea Sisneros Wichman, to submit his name for the nomination of the VISTA National Excellence Award. Be a leader in the national service movement with steam new mexico! Consider applying to be a VISTA Member for STEAM New Mexico. Not only will you be continuing the fight on poverty by aiding fellow national service members, you will be gaining access to valuable training opportunities and critical skills and experiences to help you develop and achieve your professional goals. You will join a team of STEAM New Mexico VISTA members and play an instrumental role in helping the VISTA program towards achieving its goals. The VISTA Member will: - Increase STEAM New Mexico project effectiveness; and Increase STEAM New Mexico sustainability. Opportunities are available at our official site partners CNM Ingenuity, STEM Collaborative Center, The Social Media Workgroup and AFRL. Click the link if you want to know more about VISTA openings with STEAM New Mexico and start the application process. Several positions are available with rolling deadlines and start dates. We are looking forward to reviewing your information. VISTA Noel Mollinedo will be starting a graduate degree this Fall at the University of New Mexico towards an MA in Art History. Through an art historical lens, Mollinedo intends to bring together differing narratives of land heritage in academic literature. Through tracing the word “wilderness” in all its varying governmental and environmental roles he believes he can bridge understandings of American history from disputes over “rights to nature” to climate change crisis. Even though land appropriation happens internationally, especially in a globalized economy, he will focus on human-land interactions in the Americas. His several seasons of work with government-environmental organizations will inform his research on how contemporary land relations are reinforced through a past often remembered through vacant landscape paintings and 19th - 20th century photography in the Southwestern United States. ​As a Design Specialist with STEAM New Mexico, Mollinedo has worked at the Vizlab in the Center for Advanced Research Computing. Here he created a website for STEAM NM and has helped run educational workshops on 3D Printing and designing with the SketchUp program. During his service, he was also given the opportunity to work with UNM’s Lobo Gardens as a Project Assistant helping orchestrate the Lobo Gardens Class. This also resulted in the installation of, “Lobo Gardens, An Exhibition: Rethinking Relations” a show documenting the past seven years of Lobo Gardens since its student-lead creation to its current incorporation into the Community Engaged Learning Research Program. 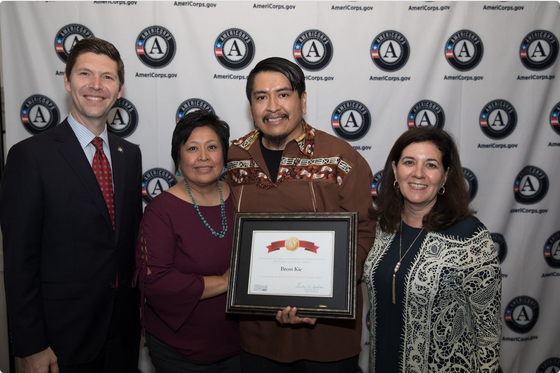 Overall, STEAM NM has been a positive year of patient growth, adapting to the challenges and lessons of serving as a VISTA with AmeriCorps. In-line with its mission to serve underrepresented and impoverished populations of the American public, AmeriCorps philosophizes that, by living a similar role, its volunteers will best understand how to help. Most likely, Mollinedo would not have returned to academia as quickly if he had not maintained a consistent presence at UNM while working with STEAM NM. Creating the Lobo Gardens Exhibit also provided invaluable experience in gallery work that will serve him in future work. Not only a stepping stone or platform upon which to realize goals, STEAM NM is also a community of diverse life paths coming together to inspire creative learning in New Mexico. Khadijih Mitchell, a current AmeriCorps VISTA at the STEM Collaborative Center at the University of New Mexico will be attending CU Boulder as a PhD Candidate in the Curriculum and Instruction-Science Education program, this Fall. As a VISTA, Khadijih better known as DeeJay, has worked to help connect students with many on-campus student organizations as well to organize educational workshops within STEM related subjects. While serving as a VISTA she completed her Masters in Education online from Eastern New Mexico University. experiences. In Albuquerque she taught some of the first classes (The first classes I taught were actually in Las Cruces, with NMSU and the Society of Physics Students) at Mission Achievement School, a new K-12 Charter School off of Yale Blvd. She revisited recently to see her high school classes be the first to graduate! (They will not graduate until May). Her hope is to continue to work with teachers in creating a curriculum that is not only heuristic but also considerate of how technology functions in the classroom. Whether navigating these virtual and physical interfaces, she sees teachers being mistreated through lack of representation within curriculum development. As the direct interactors with students, she feels it is impersonal and ineffective to not have teachers intimately involved in the development of the curriculum they are expected to deliver. Deejay hopes to help rectify the analogy of teachers to factory workers, a shift from child-centered to subject-centered that can be traced back to WWII. The politics of educational bureaucracy will greatly benefit from her presence. During her first year at CU Boulder, Deejay will focus on developing relationships that will last the duration of the five year program. Her family is excited for her but also for the shift in all their lives that this commitment foretells. She feels positive that her ideas are already valued by her receiving institution and that these upcoming years were helped by her experiences as an AmeriCorps VISTA with the STEM Collaborative Center. Biocultura will present the second Leonardo Art, Science, Evening Rendezvous (LASER) Talk Santa Fe on Friday, February 2nd beginning at 7 PM at Santa Fe Community College, Jemez Rooms. The event is free. 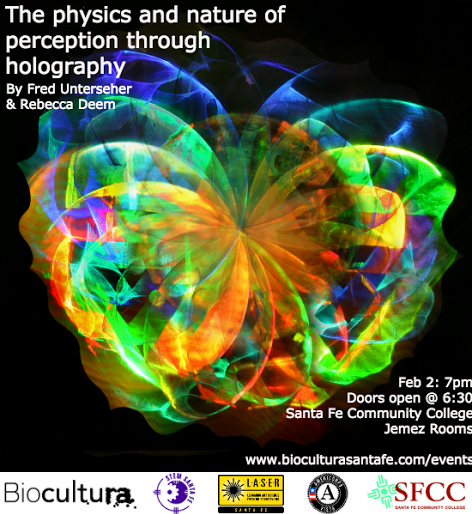 ​Biocultura will present a winter LASER Talk with pioneers of holography and Santa Fe residents Rebecca Deem and Fred Unterseher. Doors will open at 6:30 with the opportunity to view stunning works of holography. At 7:00 the presentations will begin. “The Physics and Nature of Perception, Demonstrated Through Holography,” Deem and Unterseher will speak on the art and science that has informed their decades-long careers in holography. The two presentations will be followed by a discussion and Q&A. Interested in 35 hr/wk position that lets you utilize your skills towards ending poverty? Find out how developing educational resources in your community can not only build your understanding of the non-profit sector but also provide you an opportunity to put your art and science knowledge into practice. This years Harvest Party at Lobo Gardens was a success! Students and community members from around the University of New Mexico gathered Friday afternoon behind the Real Estate Department (RED) building. Located off Girard Blvd, the RED Garden is tucked into the campus’ northeast corner, yet despite this lack of visibility more than sixty people visited over the course of three hours. The Lobo Gardens’ Class, run through the Community Engaged Learning Research (CELR) program, hosted the event. During the semester, students in the class utilized Green Fund applications to catalyze their projects over the 8 week course. The Harvest Party was the culmination of the semester and the opportunity to not only display the student’s hard work but also to invite garden participation. Visitors were invited to help stain the three layer compost bin with linseed oil, to paint a newly installed seed library, to help put donated plants into the soil from Plants of the Southwest and to participate in a plaster relief workshop where material collected from the gardens were pressed into clay. An Intro to Art and Ecology class joined the Harvest Party as well as Mary Clark from the Physical Plant Department who has helped allocate funding for projects in the garden. Appreciation was shown to all of the garden’s supporting members, faculty, students, and community, who have made the garden’s ongoing existence possible. Lobo Gardens’ plans to remain a consistent presence year-round on campus through workshops hosted by the Lobo Gardens’ Coordinator and other collaborating UNM community members. Look for flyers and Lobo Gardens pop-up sites like our new seed library!